Page 1: Introduction: is where we introduce the ten broad theories. On this page we have a table with the ten broad theories and their three concepts. In addition 3 pie charts: The five-year average for Traditional Resolution of all software projects from FY2011–2015 within the CHAOS database; the five-year average for Modern Resolution of all software projects; and the five-year average for Value-Satisfaction Resolution of all software projects. Page 2: We have our first theory with the three concepts. One table showing the OnTime, OnBudget, and OnTarget for traditional challenged projects by either percentage overrun or feature deficiency. Page 3: We have our second theory with the three concepts. One pie chart showing the percentage of organizations that do regular value assessments before starting a project. Page 4: We have our third theory with the three concepts. One table showing the value of projects in the CHAOS database in relationship to the project’s complexity. Page 5: We have our fourth theory with the three concepts. One table that represents The Standish Group’s opinion of the value of features and functions over the age of the application. As the application ages, the value of the features and functions used decreases. Page 6: We have our fifth theory with the three concepts. One table that shows the value of projects in the CHAOS database in relationship to their closeness to the organization’s strategic goal. Page 7: We have our sixth theory with the three concepts. A graphic showing the relationship of project waste to value. Page 8: We have our seventh theory with the three concepts. One table showing the value of projects in the CHAOS database in relationship to the organization’s optimization skills. Page 9: We have our eighth theory with the three concepts. One table showing how organizations carry out regular value assessments of completed projects. Page 10: We have our ninth theory with the three concepts. One pie chart showing who controls the enterprise architecture. Page 11: We have our tenth theory with the three concepts. No charts or tables. Advertisement for The Standish Group’s Resolution Benchmark. Page 12: Is the summary of the theories and concepts outlined in the CHAOS Manifesto 2015 to reduce project management costs and improve the return of project investments. One table that represents our opinion of the major benefits from each of the 10 theories. The new CHAOS Manifesto 2015: The Law of Diminishing Returns is available to members in our report sections of our website Dashboard. Non-members can join in our store. Page 1: Introduction: where we introduce the six data points of success. On this page we display 3 pie charts and one table: OnBudget, OnTime OnTarget and Traditional Resolution for All Projects. Page 2: Modern Resolution is defined as OnTime, OnBudget, with a satisfactory result. On this page we display 3 pie charts and one table: Valuable, OnGoal, Satisfactory and Modern Resolution for All Projects. Page 3: Project Size: has always been a major element in the CHAOS research. On this page we display 2 pie charts and 2 tables: Value for Large Projects, Value for Small Projects, Project Size by CHAOS Resolution and CHAOS Resolution by Project Size. Page 4: Resolution by Industry: provides another view of the CHAOS database. On this page we display 2 pie charts and one table: satisfaction level for banking projects, satisfaction level for retail projects and CHAOS Resolution by Industry. Page 5: Areas of the World shows project resolution of the 4 major geographical areas of the world. On this page we display 2 pie charts and one table: Budget Process, Project Selection Process, and CHAOS Resolution by each Area of the World. Page 6: Project Type: has a major effect on resolution. On this page we display 2 pie charts and one table: ROI for Requirements, Gain versus Risk Metrics, and CHAOS Resolution by Project Type. Page 7: Agile versus Waterfall: compares the resolution of all software projects segmented by the agile process and waterfall method by size. On this page we display a pie chart and one table: Time Boxes and CHAOS Resolution by Agile versus Waterfall. Page 8: Complexity: discusses how we determine and appraise complexity. On this page we display 2 pie charts and one table: Complexity Appraisal, Large, Complex Projects, and CHAOS Resolution by Complexity. Page 9: Goal: as one of the seven constraints. On this page we display 2 pie charts and one table: Low-Value Business Processes, Cost/Benefit Analysis, and CHAOS Resolution by Goal. Page 10: Skilled Staff: is a look at project resolution by capability. On this page we display 2 pie charts and one table: Gifted Agile Teams, Unskilled Agile Teams, and CHAOS Resolution by Capability. Page 11: Factors of Success: reflects our opinion of the importance of each attribute and our recommendation of the amount of effort and investment that should be considered to improve project success. On this page we display a table of 2015 CHAOS Factors of Success with investment recommendation. Page 12: shows additional resources and research and Resolution Benchmark benefits. The new CHAOS report: 2015 Edition is available to members in our report sections of our website dashboard. Non-members can join in our store. The Standish Group has replaced and updated the primary 12 CHAOS Charts in the chart section with the following charts. All the charts are from the new CHAOS Database from fiscal years 2011 to 2015. Fiscal year runs from March 1st to the end of February of the following year. Unless otherwise noted the total number of software projects is over 25,000 with an average of 5,000 per yearly period. In addition, all charts, except for the first chart, use our modern definition of success. Modern Resolution is defined as OnTime, OnBudget with a satisfactory result. Traditional Resolution is defined as OnTime, OnBudget and OnTarget. Modern Resolution is defined as OnTime, OnBudget with a satisfactory result. The chart shows the size of the software projects by the modern resolution definition. The chart shows the resolution of all software projects by size. The chart shows the resolution of all software projects by industry. The chart shows the resolution of all software projects by project type. Project type is the development method used to create the application or system. The chart compares the resolution of all software projects from Fiscal 2011 to 2015 within the new CHAOS database is segmented by the agile process and waterfall method. The Standish Group took great care to code each project by true agile and true waterfall. The total number of software projects in these two segments is over 10,000. The chart shows the resolution of all software projects by the four major areas of the world. The chart shows the resolution of all software projects by complexity. The chart shows the resolution of all software projects by goal. The chart shows the resolution of all software projects by capability. Chart shows the 2015 Factors of Success. This chart reflects our opinion of the importance of each attribute and our recommendation of the amount of effort and investment that should be considered to improve project success. Page 1: Introduction outlines the concept of modernizing applications while they are fully functional and in use. On page one we introduce the six steps of modernization and how to prepare for modernization. There is one chart on page one and the title is “Percentage of features and functions by frequency use". This table represents The Standish Group’s opinion of how frequently features and functions are used over the age of the application. Page 2: Introduces the concept of Crapola and how it affects modernization in place efforts. On this page we also discuss the laws of Manny Lehman. There is one chart on page two and the title is “Percent of Features and Functions by Value. This table represents The Standish Group’s opinion of the value of features and functions over the age of the application. Page 3: Presents and explains the first three steps in the six steps of Modernization. There is one chart on page three and the title is Satisfaction by Type of Project. This table represents the level of satisfaction of projects by types from the CHAOS database, covering projects from 2010 to 2014. Page 4: Presents and explains the last three steps in the six steps of Modernization. There is one chart on page four and the title is Skill Levels of Successful Modernization Projects. This table represents the skill levels of successful modernization projects, measured by on time, on budget, and with a satisfactory outcome, from fiscal 2010 to 2014. Page 5: Presents and explains the benefits of modernizing critical older applications. We also discuss the risks of not modernizing them. There is one chart on page five and the title CHAOS Resolution by Project Type. This table represents the project resolutions by type, measured by on time, on budget, and with a satisfactory outcome, from fiscal 2010 to 2014. Page 6: Recommendation on additional research and resources. Members can find this report in the reports section of the dashboard. Non-members must join to read this report. Page 1: Introduction: outlines the paper and the methodology of developing the factors of success. It also discusses the traditional definition of success and our new modern definition of success. The table on this page depicts both versions of CHAOS project resolutions, successful, challenged and failed from fiscal 2010 to 2014. Page 2: Traditional success presents the Factors of Success for successful projects as measured by the PMI traditional definition of success on time, on budget and on target. Page 2 table shows the skill levels of 10 Factors of Success by their score and rank. Page 3: Modern Success presents the Factors of Success for successful as measured by the Standish modern definition of success on time, on budget with a satisfactory result. Page 3 table shows the skill levels of10 Factors of Success by their score and rank. Page 4: Challenged presents the Factors of Success for challenged as measured by the Standish modern definition of late, over budget with an unsatisfactory result. Page 4 table shows the skill levels of 10 Factors of Success by their score and rank. Page 5: Failed presents the Factors of Success for failed as measured by canceled or not used. Page 5 table shows the 10 Factors of Success by their score and rank. Page 6: Trump Cards presents a discussion on attributes that create a project winning hand, Page 6 table is skill levels of agile teams by project resolution as calculated from the modern success metrics, from fiscal 2010 to 2014. Page 7: Moderation presents the 2015 Factors of Success as reflected by our opinion of the importance of each attribute and our recommendation of the amount of effort and investment that should be considered to improve project success. Page 7 table presents the latest point values and investment considerations. Page 8: Recommendation on additional research and resources. Haze in Thinking: is a blog post three papers of government projects. Haze report adds value to “Rethinking the Public Spending on ICT projects” report. The report considers the current state of software developed and innovation as a comparison to the current state of government projects. Rethinking the Public Spending on ICT projects report was written by Hans Mulder and Ilias Kontakos. The focus of this serious report is a commentary on the findings of the Dutch temporary committee on government ICT projects. Conclusions and recommendations of the Dutch temporary committee on government ICT projects. If you have any questions or wish to provide feedback, please contact us using the Tell Me form on our website. The new CHAOS report: Twentieth First Anniversary Edition is available to members in our report sections of our new website and available to non-members in our store. The Standish Group is offering four types of membership to our research on project performance. Report Only Membership is perfect for the casual researcher or a passive library. The Report Only Membership offers a convenient and economical way to get access to the latest Standish research reports. The Standish Group produces one new or updated research report per month including a yearly CHAOS Manifesto, CHAOS Report, Modernization in Place, and nine other new and updated research reports. Please see list of reports for 2015. Professional Membership is perfect for the adept researcher or active library. Professional Membership provides access to the Standish Group Member research website. The Member research website has three major parts: research reports, SURF database, and CHAOS Knowledge Center. The Professional Membership includes 12 hours of virtual research and advice. Skills Appraisals Membership is perfect for the Project Management Office (PMO). The Skills Appraisals Membership provides a platform for the monthly meeting to run internal workshops. Membership includes all things needed to create and execute 11 workshops with up to 10 people in each session. The membership includes a detailed instruction manual with suggested meeting format, agendas, meeting tips, and questions. Resolution Benchmark Membership is perfect for IT executive management that wants to measure the organization against 1,000 other organizations. Resolution Benchmark measures your closed projects against our CHAOS Database. Your projects are profiled and segmented by industry, project size, organization size, methodology, types, geographic area, skill levels, and other attributes. Resolution Benchmark measures the six success metrics (individually and in combination): on time, on budget, on target, on goal, valuable, and customer satisfaction. For the last five years, however, we have also been studying a parallel track that turns out to be orthogonal to success. Rather than measure projects by the expected triple constraints (cost, time, and quality) we came up with a value measurement system. We have learned that much of what we do to ensure a successful project outcome is counter to creating value from your project investments. This is called the Success versus Value Orthogonal. In the report we show a graphic of a compass with relationship between value, success, failure and worthless. Value is at the top of the compass (north) and success is at the right side of the compass (east) or 90 degrees from value. This is the meaning of orthogonal. CHAOS Manifesto 2014 details why success is often in conflict with true value, and describes a better way to increase the value of your project investments. In this value-based approach to project management we recommend SAFE projects, not because they are without risk (and some will fail, but that’s OK), but because they are simple, absorbent, fast, and economical. As part of our Value-based PM approach, CHAOS Manifesto 2014 highlights 20 “rules” based on the Success versus Value Orthogonal. In CHAOS Manifesto 2014 we are exploring other measurements of project success to consider value and other metrics. We have spent the last several months coding our CHAOS database with these new metrics. The current CHAOS database is coded with the following attributes: on time, on budget, on target (% requirements), and satisfied (very high to very low). We already coded the database with value (very high to very low) and how closely it meets the strategic corporate goal (precise to distant). The CHAOS Manifesto 2014 includes the Success Value Comparison Table. The Success Value Comparison Table compares the success driven approach against the value driven approach. Some of the key attributes are scope of measurement, how they are managed, compliance/governance, budget process, project types, and project mix. 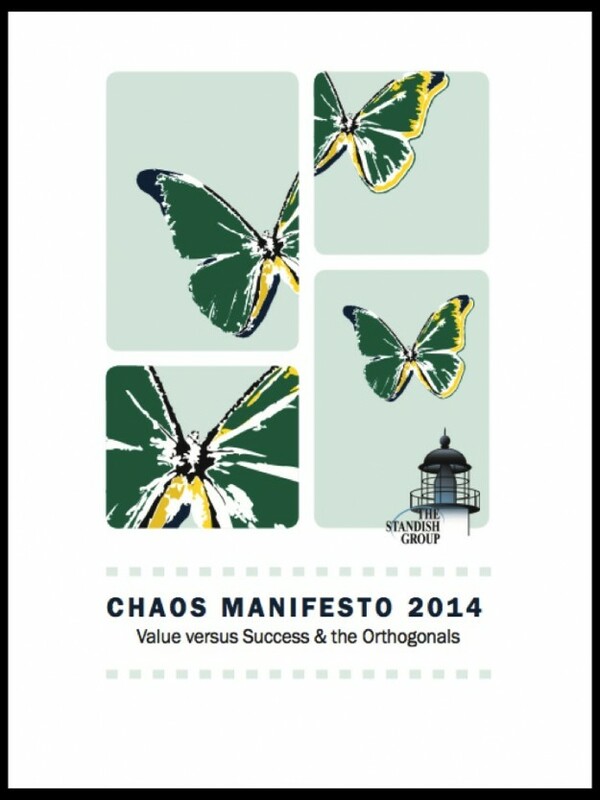 Members can download the CHAOS Manifesto 2014: Value versus Success & orthogonal in the report section of the new website. Non-members can purchase the report in our store. Displaying 21-30 of 32 result(s).